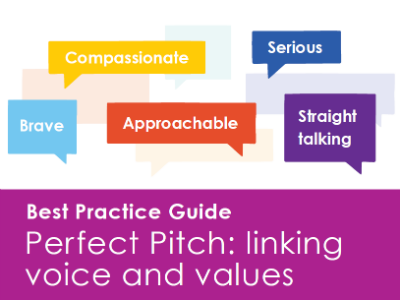 We’ve updated our Best Practice Guide on tone of voice, Perfect Pitch: linking voice and values. In the first edition of our guide, we highlighted the potential risk when members of the same sector start reviewing how they speak to their audiences, and developing tone of voice guidelines to stand out. It’s pretty easy for peers to catch up, and so what may have started as a distinctive way to use language becomes the norm across the sector – with everyone sounding the same. For those developing a tone of voice for a charity, and looking for a way to sound distinctive, the challenge will be to go beyond generic descriptors like ‘warm’, ‘friendly’ and ‘positive’ that could be applied to any charity, and use language to reinforce what is truly particular about their organisation. As World Vision UK has shown, it’s possible to claim and use language in ways that subtly reinforce your charity’s approach and what you want to be known for, as well as grabbing your audience’s attention with copy that’s warm, friendly and positive. As consumers, we now expect services and products that are fine-tuned to our specific needs. The challenge for charities is how far we use all our channels, and the data we collate on individual preferences, to personalise our communications. How we use language is only one element of this, but an important one. Each channel or social network has its own tone of voice, and our job is to discover and flex our approach to suit the platform, while not losing sight of our own organisational way of speaking. It will be interesting to see how charities tackle this challenge. We’ve also seen the growth of the ‘connected consumer’ – the increasing number of people who would rather turn to their social networks of friends and contacts for advice, support and recommendations, than visit an organisation's website. The challenge here is blending your own voice and the voices of social advocates in ways that contrast and complement each other, as part of an integrated approach to communications. In this guide, CharityComms and Self Communications have teamed up once again to help demystify tone of voice and support charities to find their own distinct way of talking about themselves and their work.